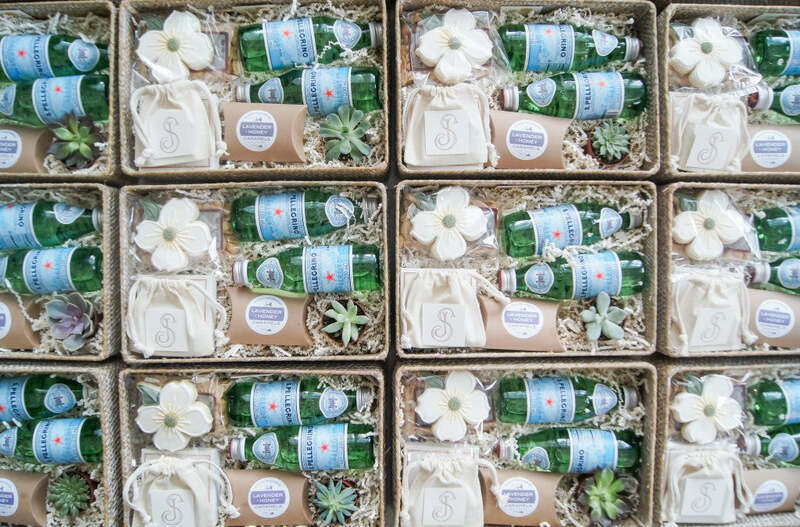 There are few words to describe today's Charlottesville, Virginia wedding welcome gifts except to say they are hands-down a personal favorite! Our couple planned their wedding with the expert help of Taz Greer of Easton Events, and it’s safe to say Jen, Shane, and Taz all have impeccable taste! We kept the couple’s wedding location at the heart of the welcome gift’s design along with their dusty blue and copper palette. 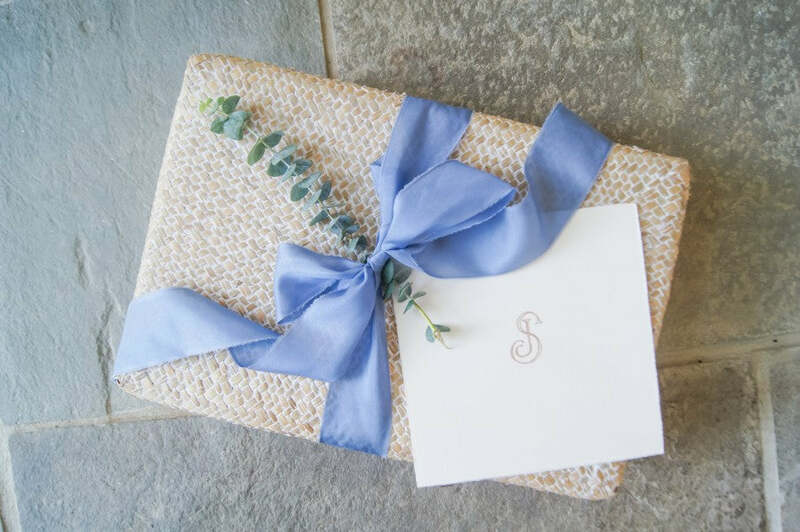 A great gift begins with beautiful packaging, which is just one of the reasons why I selected a white-washed sea grass basket complete with a lid. 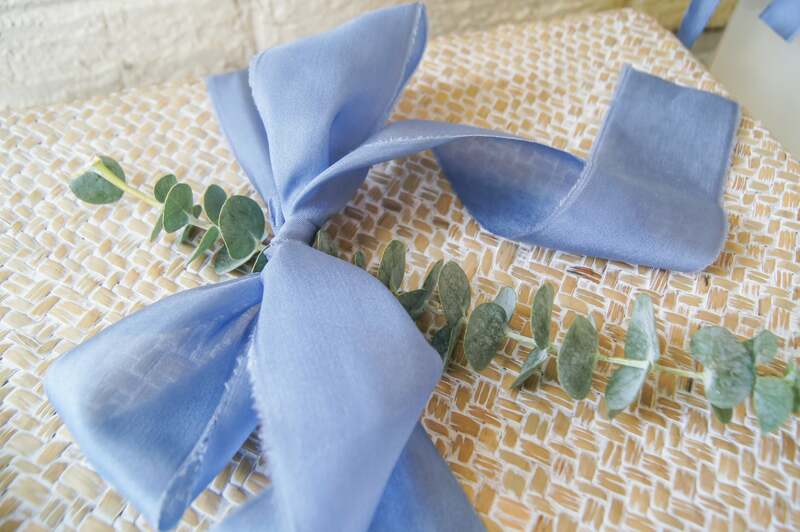 The piece can easily be reused by guests, and the color allowed the dusty blue Adorn ribbon to pop! Anyone else notice how ribbon instantly transforms a gifts, especially when it's silk? Inside, it's nods to Virginia all the way! 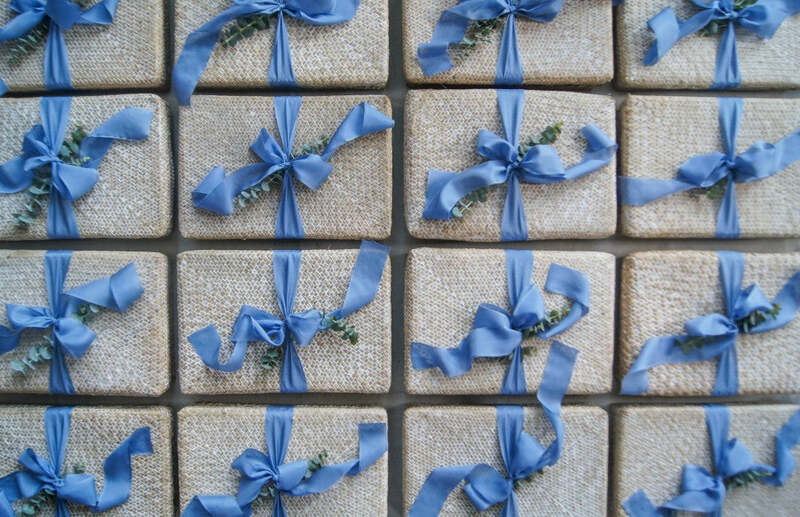 The custom dogwood cookies by Two Sugars Dessert Studio look almost too good to eat. We also added artisan Fleurir Chocolates, lavender & honey caramels, and Whitley’s Virginia peanuts – the perfect array of local businesses! 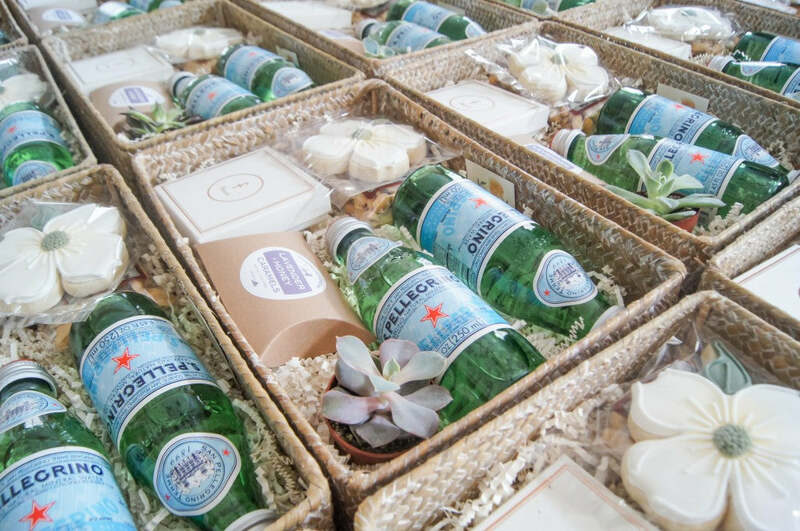 With so many sweet and salty treats, San Pellegrino sparkling water was a perfect compliment. The personalization and customization continued inside each gift with more thoughtful details. 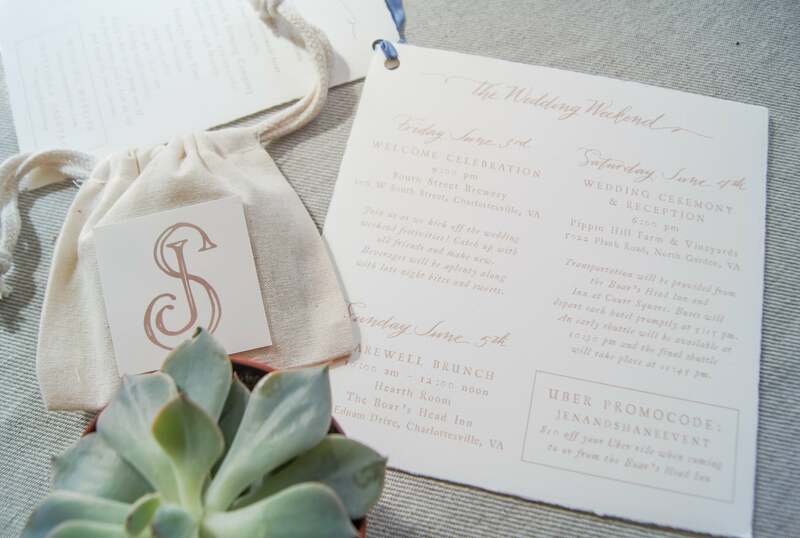 We teamed up with Rock Paper Scissors Design for a custom made wedding welcome booklet. 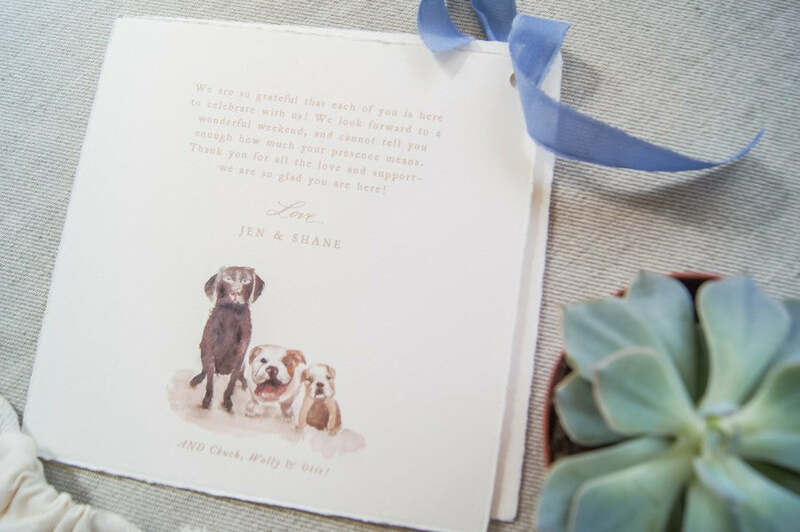 Each booklet contained the weekend’s wedding itinerary, locations, a beautiful monogram, and custom sketches of the Jen and Shane’s adorable pups, Chuck, Wally, and Otis! A mini potted succulent, a favorite of the bride, was added as a lovely finishing touch. With Taz and Easton Events at the planning and design helm and Jen and Shane being such a gracious couple, I would've loved to have been on the guest list! We’re sure this thoughtful pair enjoyed a wedding weekend that guests will forever refer to as “the best ever”. To see more of our gift designs, just like this one, make sure to hop over to the gallery!